Today is my much-needed rest day. Definitely enjoying the break from workouts both physically and mentally. However, I won't lie, a run was every so slightly tempting because we had a cold front move through. Temps have gone from 90's at the beginning of the week to a high of 75 today! But, I'll save the run for tomorrow instead. This sort of brings me to a post that I really agree strongly with. My friend Jess at EatDrinkBreatheSweat wrote a great post yesterday called (run)Streaking. Basically, it addresses everyone jumping on the run streak bandwagon - the latest is actually being encouraged by Runner's World. I have been down the path of over-training syndrome. I don't just mean working out too hard and over-use injuries. I mean flat out over-training to the point of depression, utter fatigue, but still pushing harder. Never resting. It was a very vicious mental cycle I had to over come. I vowed never ever to do that again. I cherish my rest days. I know the importance of varying your workouts in terms of intensity as well. But a running streak? It calls for running every day. Even on your rest day? So some will say, "ok 'only' a mile on rest days." That doesn't sound too bad does it? But like Jess points out, running is so demanding (physically and mentally). For lifters - can you imagine lifting every single day? And I don't mean splits, think full-body every day. Anyway, I am not meaning to take away from Jessica's post. Please go check it out. I know she'd love to hear your thoughts! I had a few ideas I was kicking around for Fun Facts Friday, and then I received a blogger award. This always makes Fun Facts Friday easier of course! 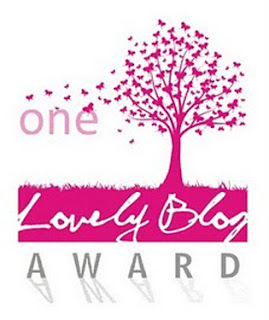 I was nominated for the One Lovely Blog Award by the super cute Kierston at Candy Fit. If you haven't checked out her blog, you really should. Post the award logo and picture on my blog and link back the person who nominated you. Nominate up to 15 additional bloggers who you think deserve the award. Post a comment on the blog of each nominee to tell them they have been nominated! I am not a morning person, but I do go into work by 7 am. Just don't talk to me for a while. I'm getting my second ever manicure tomorrow. I adore chips and have to simply not buy them or I'd eat the whole bag. Cougar Town is one of my fave shows - I think it's b/c they love their wine. I think I should be a personal shopper. Paid to shop? Um yes please. Sometimes I can be really pessimistic and I have to check myself on that bad habit. I absolutely hate tailgaters (as in people who ride your bumper). Back the eff off. Even though I'm only nominating a few bloggers, I would love to hear at least one random thing about you OR tell me a blogger who deserves this award!